Add Weather & Graffiti Protection (POF)--Only $9.95! 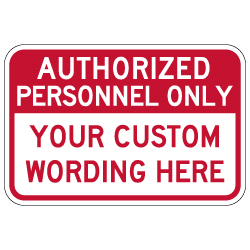 This Custom Authorized Personnel Only sign can be the right choice for businesses, government buildings, or land owners to prevent unwanted pedestrians from entering into restricted areas of your property, or when a noticeable yet discrete notice sign is wanted. Made with the same durable materials as our larger security signs, this smaller Customized Authorized Personnel Only sign is on heavy-gauge and rust-free aluminum, with reflective sheeting making it visible in nighttime environments with ambient light. And just as with our larger security signs, you can have us add 3M weather and graffiti protection, which virtually doubles the no-fade lifespan of your signs, keeps them cleaner over the years, and even allows for the removal of graffiti using only mild detergent and water. DOUBLE the working life of your reflective Authorized Personnel Only Signs signs by adding 3M Protective Overlay Film (POF)! 3M’s high-tech POF protects sign faces against fading caused by the sun and harsh weather—and makes graffiti and sticker defacement damage easy to clear away without harsh abrasives.